(Quick Effect): You can discard this card, then target 1 Thunder monster you control; it gains 500 ATK. 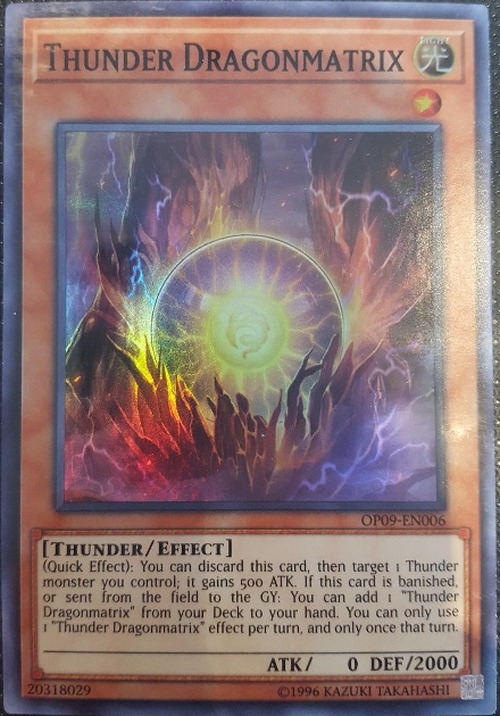 If this card is banished, or sent from the field to the GY: You can add 1 “Thunder Dragonmatrix” from your Deck to your hand. 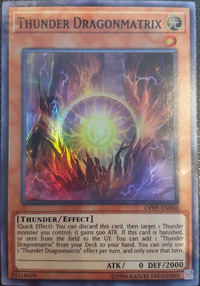 You can only use 1 “Thunder Dragonmatrix” effect per turn, and only once that turn. Various of this monster appears in the artwork of Thunder Dragons' Hundred Thunders. This monster appears to be a younger version of Thunder Dragondark, as reflected by its name. This monster has an Insect counterpart, Cocoon of Evolution, and a Dinosaur counterpart, Miracle Jurassic Egg.